Of all the types of material that we localise for companies, marketing content is perhaps the area that is most susceptible to “heated” discussion and ultimately, potential trouble. It’s understandable really. The way your message comes across is almost as important as the product or service you’re marketing. Everyone wants to know and understand how the message comes across in Japan, say, relative to how it’s perceived at home. Our customers take diverse approaches to their localised marketing content. On one end of the scale we have companies who want to keep a tight rein on what’s being said locally and want the message to be almost a literal translation of the source content. This can reduce their ability to be funky and “local” in their approach and it really can influence how their English content is phrased. At the other end of the scale, some of our customers’ copy differs completely between their source content and the localised material. The localised message reflects the source message in general concept only, while the language, phraseology and tone are absolutely geared to the target market. Although all local marketing output is consistent in its core message, it often bears little or no resemblance to what is being said in sister markets — this is true ‘transcreation’. The majority of our customers lie somewhere in between, as you might imagine. The key to striking the right tone is to make sure that the people writing the original English copy and the teams responsible for marketing in the target country agree on the local objective. There needs to be a clear directive for localisers about how far they can, or how far you want them to, stray from the source message. Establishing the process and tone for local marketing needs to yield a consistent, repeatable output. Localisers will want to know they can trust the intention of the local office, to avoid constant rewriting, correction and confusion. 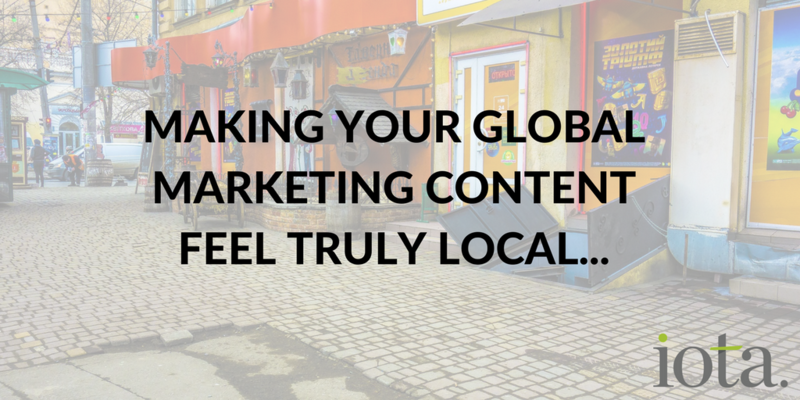 Cost can often determine the direction for localised marketing content. The closer the localised content is to the source content the lower the cost, typically. While the cost of a marketing translator will often be more than a regular translator, it is a still a relatively defined and predictable cost item, charged by the word. Once you cross over to “indigenous” message compilation and transcreation, where the localised text bears little resemblance to the source, you pay for creative development of marketing pieces, which is significantly harder to acquire and much more expensive — perhaps three or four times the cost. If you’re about to embark on a local marketing campaign, bring the stakeholders together and agree on a common objective. Early buy-in will save you money and heartache in the longer term. We’re here and happy to help in any way we can.